Sumac can be eradicated but requires special attention to its manner of growth and reproduction. Although it is native, sumac is highly invasive. Allowed to proceed unchecked, it is able to take over a prairie or savanna natural area. 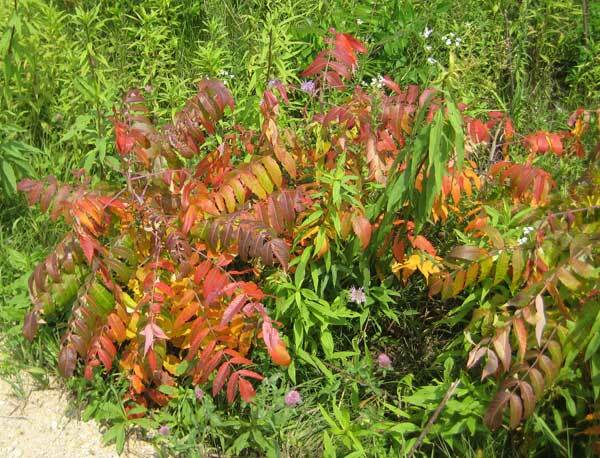 The shade under a sumac patch can be enough to suppress virtually all native vegetation. If the character of a natural area is to be maintained, control of sumac is essential. The techniques described here are based on studies and observations done over the past five years on both large and small sumac clones. Sumac is very sensitive to herbicides such as triclopyr (Garlon 3A and 4), so that existing stems can be killed by cutting and treating, or by basal bark treatment. 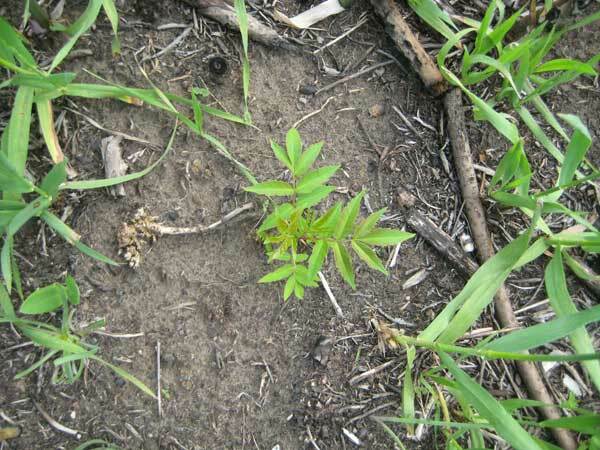 However, although herbicide treatment will kill above-ground stems, rhizomes and the buds that turn into root suckers usually escape treatment. 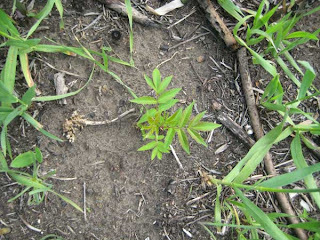 If sumac is to be eradicated, these below-ground parts of the clone must be dealt with. A principal part of the present post focuses on how root suckers can be eradicated. Mowing is often recommended as a means of controlling sumac. What happens when sumac stems are cut? Along the length of each sumac stem are buds that remain dormant as long as the top part of the stem is alive. However, if the stem is cut, one or more of these dormant buds are released and grow. The photo to left shows the response of a sumac stem to cutting. Thus, it is not possible to eradicate a sumac clone by mowing, although mowing can work well as part of an integrated management system. Fire is often recommended as a way of controlling sumac. 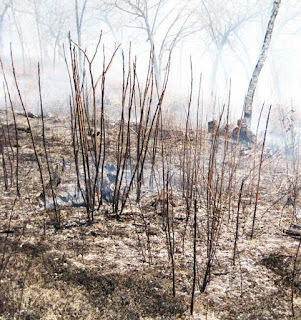 What happens when sumac stems are burned? The terminal growing shoot and all the buds along the sumac stem are generally top-killed by fire. However, each sumac stem has one or more dormant buds present at its base. Since these buds are below the soil surface, they are not harmed by fire. Therefore, when a stem is top-killed by fire, a dormant bud of that stem becomes activated and sends up a new shoot. 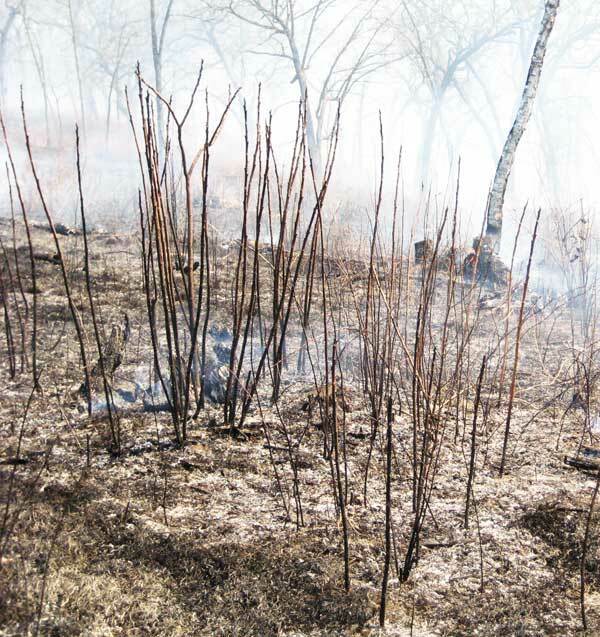 Thus, the sumac plant resprouts vigorously when killed by burning. The photo to the right shows a new shoot just starting from the base of a stem that had been top-killed by fire. What happens when sumac stems are treated with herbicide? 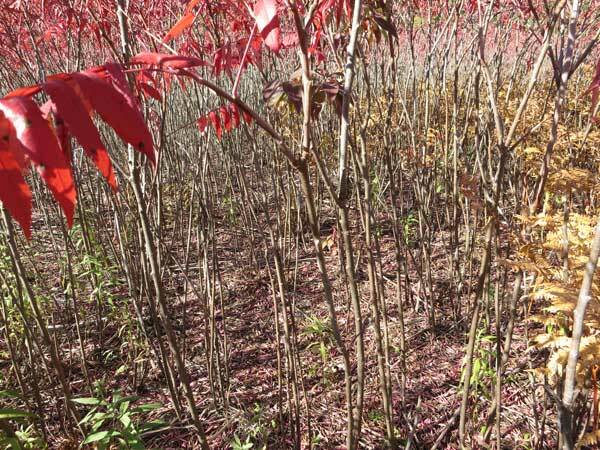 When a sumac stem is treated with triclopyr, either with a foliar spray of Garlon 3A, or a cut stem or basal bark application with Garlon 4 in oil, the stem and all its above-ground and below-ground buds are killed. The stems of this small sumac clone were treated with Garlon 4 by basal bark. Within a few days the leaves exhibited damage by turning red and within several weeks the whole plant was dead. Thus, although the above-ground sumac plant can be killed by either fire or herbicide treatment, root suckers are formed from buds within the extensive rhizome complex. In fact, more root suckers may be formed than there were in the existing above-ground stems. Therefore, killing of root suckers is essential if the clone is to be eradicated. Typical root sucker, arising from the hidden underground rhizome system. Note that there is no sumac stem nearby. How are root suckers eradicated? 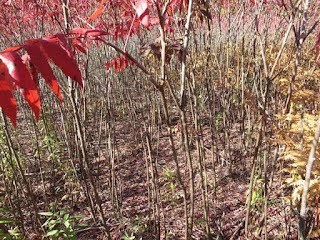 Whenever a sumac clone is treated in such a manner that its above-ground parts are killed, it must be monitored for the formation of root suckers and when they are found they must be killed with foliar Garlon (3% aqueous Garlon 3A). Each root sucker must be sought out and destroyed. Not all the root suckers appear at the same time. The timing of this search-and-destroy operation will depend on the growing conditions at the site, and must be done for at least three years. Locating sumac clones Very large clones are easy to locate. Smaller clones are harder to find but should be given high priority since they have the potential of making larger clones. 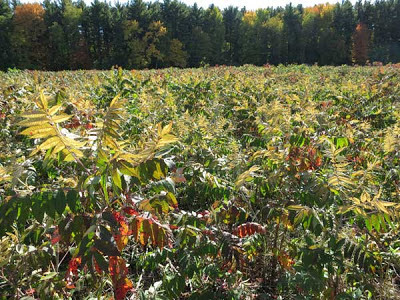 Since sumac leaves develop intense red color in the fall of the year, this red color can be used to look for sumac clones. Mark each clone, either with GPS or with a permanent marker (wooden stake, rebar, or other suitable marker). Each clone should be given an control number. Eradicating a large sumac clone: an example. Here is an example for southern Wisconsin (probably applicable to other nearby states). This work was done in a high-quality remnant prairie where sumac had become established. 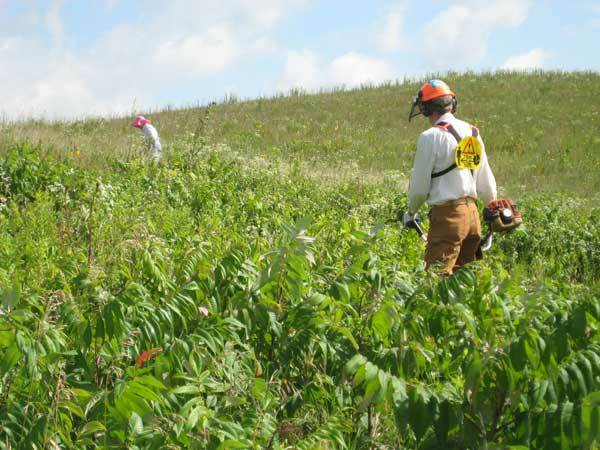 On August 1, 2009 the sumac stems of a clone were mowed with a Stihl brush cutter and all the cut material was hauled away. There were 202 cut stems, each of which was treated with 20% Garlon 4 diluted in bark oil. Treatment was a combined cut stem and basal bark. Seven weeks after cutting and treating the results were monitored. The Garlon 4 treatment of the cut stems was completely effective. Because it was late in the season, no root suckers formed, but they were anticipated for the following year. In 2010, the next growing season, the plot was monitored frequently. Root suckers appeared throughout the season and by late summer 183 root suckers had been formed. Note that none of these root suckers arose from the original cut stems. As the tally was being carried out, each root sucker was sprayed with aqueous 3% Garlon 3A. This herbicide treatment was very effective and all root suckers were killed. The following year (2011), the plot was monitored again and 25 new root suckers were present. These new stems were treated with Garlon 3A. In 2012, three years after the original procedure, no new root suckers were present. A summary of the results is shown in the graph. Thus, in this study it was possible in three years to eradicate the sumac clone by cutting and treating followed by treatment each year of all new root suckers. During the three years that this study was underway, the area of this sumac clone was not barren. Many good species moved in. A survey done at the end of the study revealed the following species: flowering spurge, showy sunflower, rosin weed, compass plant, spiderwort, prairie thimbleweed, bergamot, butterfly milkweed, rough blazing star, false boneset, lead plant, evening primrose, Indian grass, little bluestem, and solomon’s seal. 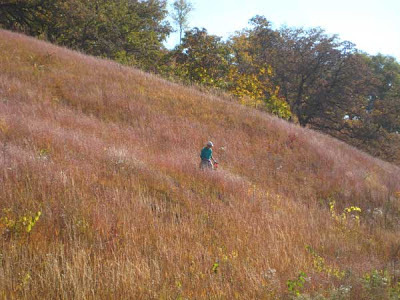 Thus, the dense sumac monoculture was converted into a highly diverse prairie! glad I found this - I am so frustrated by the sumac taking over my back hill. I plan to try the techniques you have outlined. 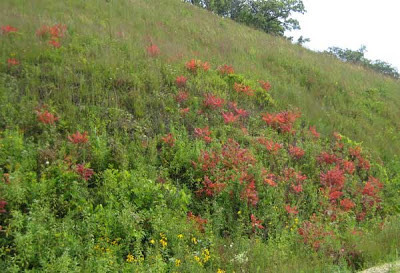 Thank you for posting this information - I plan to try to eliminate the sumac that is taking over my back hill. I have a patch of sumac on the edge of our lawn. They have been sending shoots under the lawn and coming up in the raised vegetable garden. If I treat the shoots in the vegetable garden with the herbicide should I hold off on trying to grow anything in the garden til they are gone? The vegetable garden has been dormant for several years and I just started weeding the other day. That's when I found all these roots that had been cut back but still growing everywhere under ground in the garden. Aghh ! If I cut branches at base, is it ok to spray the group (200 or so) or is it better to brush on the triclopyr on each individual base? I have a thick growth which has lost its leaves for the winter. 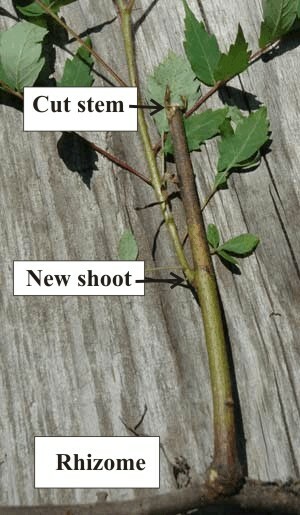 It is much easier to cut the stems in the winter when the leaves are gone, and I want to follow up with herbicide. For certain reasons, I only use foliar/water-based Garlon 3; I do not want to use basal/oil-based Garlon 4. QUESTION: does it do any good to treat the stems with #3 after cutting them in winter, when they are dormant, or should I wait and hit the new leaves with #3 in the spring? I have a bunch of sumac growing within a forsythia bush in my yard. I don't want to kill the forsythia but I'm afraid I might have to. My neighbor recommended using rock salt but I want to eventually plant something in that spot once the sumac is gone for good. My neighbor has a dense growth of sumacs in his front yard and thinks they are the greatest thing since sliced bread!! I spray them with weed spray in my yard but as this says, they just resprout. They come up in the seams of my driveway and even in my crawl space. Is there anything I can do to eradicate them in my yard without harming the lawn?